seeing all the love themed cards and all those hearts! After viewing all the entries, the Chic of the Week is Calypso with this fabulous card. 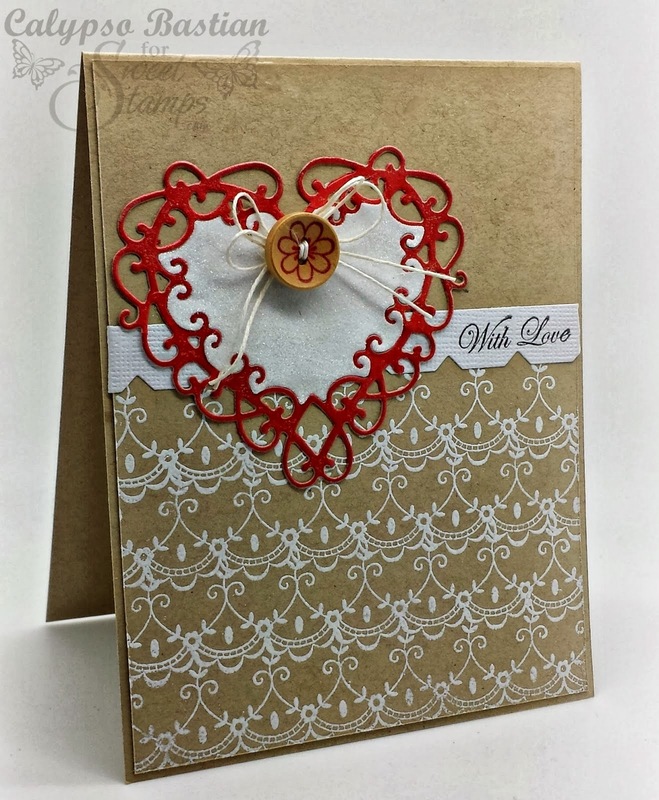 I just love the layers of stamped lace on the kraft and the red die cut heart is stunning. Betty's card box. Fabulous CAS design and love all those polka dots. Sarah's wonderful mix of patterned hearts. Calypso, please send an e-mail to mritzen(at)shaw(dot)ca so I can send you your Chic of the week badge. Make sure to come back tomorrow for our monthly sketch challenge hosted by Maria. Congrats ladies! Calypso, your card is beautiful...that stamped lace is just amazing! Congrats Calypso -- it's a beautiful card. Get out of here!!! OMG.... I am completely speechless and honored to have been selected. Thank you so much!!!! Thank you... Thank you!! !